If there's a chance that if your PAG-IBIG RTN number lost? What happen to your PAG-IBIG number? It is very inevitable that one of us lost or forgot our pag-ibig mid RTN. This procedure below is one of the solutions that can solve your lost and forgotten pag-ibig mid rtn number. Before anything else and for the best possible way to do the lost RTN number of yours. We will define each term first. You already know the steps on how to get your pag-ibig mid number through your pag-ibig RTN number by just following steps. 1. email and ask pagibig for your pagibig number(publicaffairs@pagibigfund.gov.ph). Provide your fullname and Birth date. 4. And then select the last option “Update Registration Information using the Pag-IBIG Membership ID (MID) Number”. And then click Continue. 5. Input your pagibig mid number , your name and family on the fields provided. This method saves time in filling up all the fields that you already filled up. And just update what is needed. Or you just want to print your MDF right away. - If it happens you lost your RTN number, just visit the office you are applying for your PAG-IBIG application as soon as possible. They have a copy there and a track of your record and you can ask them for another RTN. 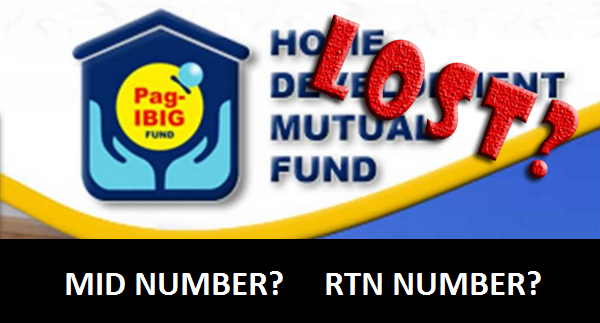 Just tell the truth that you accidentally lost your RTN Pag-ibig / FDMF (Home Development Mutual Fund) Number. -I am already a member and had filled up the form a long time ago and now, i thought I forgot my number and had created a new one. Now, I found my details from the old one and want to use it. Is the old one discarded already, or can I still use it. Hope for your quick response regarding this matter. -What if I lost my RTN number accidentally? - I lost my RTN number, what to do? I forgot my pag ibig number.. how can i get my pag ibig number? So this content is all about retrieving lost and forgotten pag-ibig mid rtn number advices and solutions.